Chanteur et steel guitariste US né Shirley Ray Bergeron, le 16 Novembre 1933 à Point Noir, Church Point (Louisiane). Shirley Bergeron est décédé le 18 Novembre 1995 à Church Point (Louisiane). 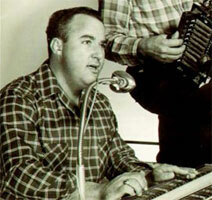 Cajun singer and steel guitarist Shirley Bergeron (a man, not a woman) recorded, for the most part, standard Cajun music in the late 1950s with his accordionist father Alphee Bergeron and backup band the Veteran Playboys. Cajun music for the most part, that is, because there was one 1962 single, "French Rocking Boogie," that tried to get some action by fusing Cajun with rock'n'roll. Actually it was a pretty enjoyable, energetic track, and the one that Shirley Bergeron is most known for among collectors. However, for the rest of his recording career Bergeron stuck to Cajun music of a much more typical sort, always accompanied by his father Alphee on accordion. 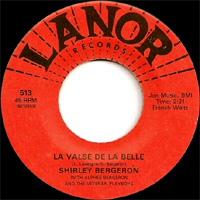 Alphee Bergeron had done one 1949 single with the Veteran Playboys, but Shirley made his recording debut in 1957 with two songs at a radio session that eventually got issued on an LP. There were some recordings for Goldband in 1960, but Bergeron spent most of the 1960s doing singles for the small Lanor label, recording at the Crowley Studios run by Jay Miller, who did so much for Louisiana popular music of all kinds in the 1950s and 1960s by cutting bluesmen like Slim Harpo. Some of the Lanor recordings had drums, but Bergeron just used guitar, Alphee's accordion, violin, and triangle when he recorded the album Cajun Style Music at the music store of Marc Savoy in Eunice, LA in late 1969. A compilation of Bergeron's 1957-69 sides, French Rocking Boogie, came out on CD on Ace. 1960 SP LANOR 508 (US) J'ai Fait Mon Ede'e / ? 196? SP LANOR 509 (US) Chez Tanie / ? 1963 SP LANOR 510 (US) French Rocking Boogie / ?